As if pudgy, middle-aged moms crowding the lineup at your local surf spot wasn’t enough, look for them to appear at your gym for a Surfset Fitness class. 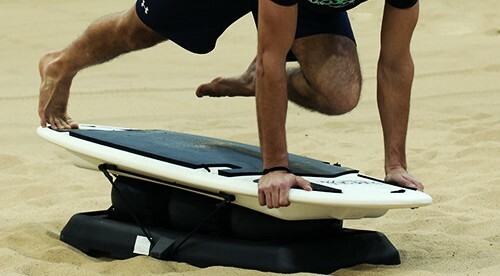 Billed as the “only total body surf-style trainer” the Surfset RipSurferX combines balance and resistance training said to improve cardio, strength and endurance. We’ve reviewed other balance trainers (and here) and resistance equipment and for the most part their simplicity and cost make them a reasonable choice for manhy. The RipSurferX is not yet available for the home user, so you’ll need to find a class to get started. Our only hope is the RipSurferX keeps the surfers in the water and clears-out the lineup for those of us looking to… surf.